There seems to be a general trend to eliminate objectivity when it comes to reporting the news, at least locally. Gaining an unbiased report of developments and events during the day has become a difficult task. One outlet will show a slant in one direction, all the while completely ignoring what could be an equally or more important story. Alas, as Ben Franklin is credited as saying "Freedom of the press belongs to those who own one". 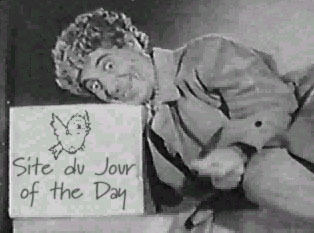 The name Creepy Steve may have a familiar ring to it for Site du Jour of the Day readers who enjoyed Humor in the News By Creepy Steve (http://humorinthenews.weblogs.com/) (SdJotD 010621) back in June 2001. Humor in the News By Creepy Steve isn't as active a project as it once was, but it still works. Instead of focusing on Humor in the News By Creepy Steve, Off On A Tangent: Hot Girls, Cold Beer, Fresh Links would seem to be the object of Creepy Steve's time these days. Off On A Tangent: Hot Girls, Cold Beer, Fresh Links is a Weblog that explores general interest topics and sites along with other things that give Creepy Steve a thrill. Those things include photography, popular culture, computers, and as the title proudly exclaims  Hot Girls and Cold Beer. In reality, the girls and women are hot in the context that they have had recent media attention although some are pretty darn foxy at times. Voice of America is a part of the United States Government that most Americans have heard of. Oddly enough though, most Americans have never actually heard the Voice of America. Because of legislation, Section 501 of the Smith-Mundt Act of 1948, Voice of America is prohibited from broadcasting into the United States. Voice of America programming is broadcast around the world on shortwave, AM and FM bands along with satellite television. In addition to localized broadcasts, programming is also available over the Internet as streaming audio in over fifty languages and video in a dozen language versions. Chances are good that you have made a wager at least once in your life. For many people, taking a risk on the outcome of an game or sporting match has become a method of earning a living. For others, the act of gambling is part of a larger picture. A vacation to a casino town or a weekly ticket in a lottery perhaps. The most important factor in all of this and the one that seems to be the least understood is the degree of risk one is willing to take. Games of chance are often just that, a series of seemingly random actions and an outcome either in favor of the individual running the game or the individual playing the game. More often than not, it's the individual running the game. That brings us to The Wizard of Odds site. While there are routes to actual gambling available, the tutorials on dozens of games and types of betting are fairly complete and well written. The Java Games are a fine addition and the The Wizard of Odds is also a unicyclist.